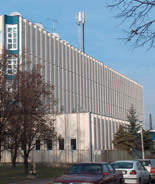 We have more then ten years experience of implementation of professional infocommunication wireless networks in Hungary and in the surrounding countries. We are ready for the installation and dismounting of different indoor and outdoor telecom equipment of wireless networks. During our activity we installed low capacity P-P and P-MP microwave radios, microwave SDH radios, optical SDH euipment and SDH multiplexers, intelligent cross-connect equipment, base station transmitters, ADPCM, data radios, DC uninterruptible power supply systems and inverters. We are prepared for the testing of batteries. We are ready to do maintenance of networks and to repair the telecom equipment. We have the necessary infrastructure and logistics background.